Much as the straw that eventually breaks the Everything Bubble’s back may well be something few saw coming, the global interplay of Fed debt buyers and sellers can shed light on dynamics common sense would never suggest to find. Perhaps the least likely candidates to sop up over $1T in nothing-yielding Fed debt? Mutual funds. And yet, that’s exactly what they’ve done. According to the Federal Reserve, it began normalizing its balance sheet in late 2017. In particular, the Federal Reserve holdings of US Treasury's have been reduced by a little less than $70 billion since peak holdings. This is about a 2.7% reduction in the Fed's Treasury holdings, so far. The Fed plans to continue rolling off Treasury holdings as they mature, at somewhere between $30 to $50 billion monthly, in a "data dependent" fashion likely until they halve their current holdings (give or take hundreds of billions). I'm "amazed and shocked" that as the Fed focused its balance sheet reduction solely on mid duration holdings and bought short duration...the short end rose significantly vis-a-vis the mid and long duration. 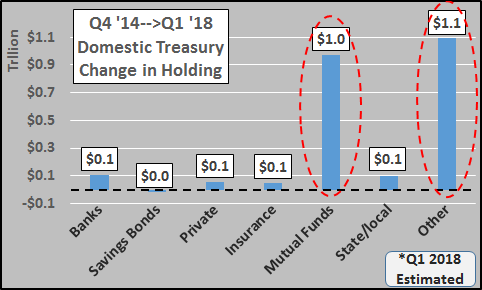 So important to note that as all recognizable sources of Treasury buying have wound down, ceased, or turned to outright selling...prices and yields haven't reflected this "free market" implication despite continued record federal trade and budget deficits. In a situation where nothing adds up, that in itself adds up (likewise, remember, Bernie Madoff's #'s never added up, and that was the point). These domestic sources of buying are led by that juggernaut of funding known in the Treasury reports as "other". Not domestic banks, not domestic pensions, not insurers, not state or local governments...no it's mutual funds assisting the massive bid from "other", loading up like never before on US Treasury debt and saving America from interest rate Armageddon.